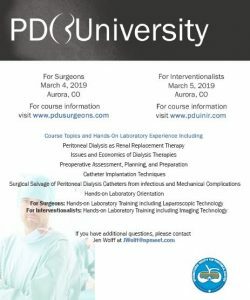 PD (Peritoneal Dialysis) University for Surgeons is a two-fold approach to training general surgeons to place catheters for peritoneal dialysis using laparoscopic techniques. The course consists of didactic lectures followed by comprehensive hands-on workshops. The hands on workshop sessions are designed to take the general surgeon through the entire process of catheter placement; including pre-operative catheter exit site selection, catheter implantation, and exteriorization and dressing. The course is limited in size to maximize the learning experience and time for collaboration with the faculty. A similar course is available for Interventionalists. For more information, please visit www.pduinir.com. If you have questions please contact Jen Wolff at jwolff@npmeet.com or call (866) 512-8801.